The red carpet is either a thoroughfare for trains or a running river of fishtails. Sometimes, if we are lucky, there’s a fish or two out of water and we all gape in awe. Such was the case with two separate sightings of pants (gasp!) on women (you mean, it’s not the 1950s?) at last night’s Golden Globe Awards. 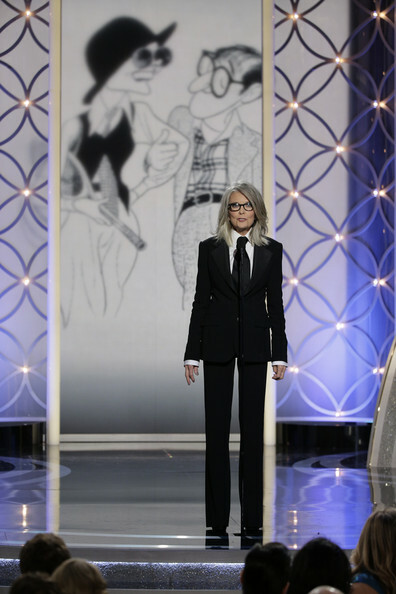 We’ve already discussed Diane Keaton’s reign in an RL made-to-measure and meant-to-impress black suit. It was all part of Sunday Night, brought to you by Ralph Lauren. It wasn’t the phat tie that had me purring, but rather the narrow flare of those trousers. Static shots don’t do them justice, but those pants were singing to me. A suit will always be suitable pour moi, and for Ms. Keaton. Keaton is nothing, if not consistent. She knows what suits her and it is quite often, a suit. It’s usually a bit quirky and accessorized with a smirk or two, and she seems amused at the fact that we don’t always agree with her choices. I greatly respect a woman, though, who embraces the grace of her age – and her personality and has fun with her fashion. And my dears, let me be clear that I don’t care what the actual age of the woman is – but that she own it. To me, a 60-something woman trying to look 20 years younger is as equally self-disrespectful as a 20-something trying to dress like she’s lived another 20 years already. That’s precisely the reason I wanted to hug Emma Watson upon first sight. She looked darling in her Dior Couture. She owned it. It did not wear her. The dress fit her beautifully, the colour complemented her complexion, the hair and jewels were well curated, and the pointed blue pumps hinted at something playful. Watson, we won’t need Sherlock to confirm your style secret. Turns out they were right! Matching the indigo instigators, were midnight skinnies. Fashion math = dress + pants. The skinny on celebrating your age. The Dior take, or rather, Raf’s rif, was a sashed back which revealed a little skin and yards of style. I thought Watson’s Dior triumph trumped any others that the House may have helped attire. No restraints on beauty here. She was one of my favourites and may even be up there for one of the best red carpet looks I’ve seen in years. See all the posts from this year’s Golden Globes. Images: Emma Watson photos by Jason Merritt; all photos courtesy of Getty Images North America.